Chances are that your Rancho Cucamonga business uses lots of different electrical devices. Lights, chargers, cash registers, computers, automatic doors, printers, etc. – for your business to work you need the power to make it run properly. To do that, you need the right electrical infrastructure so that the power can get to where it needs to be. Empire Electric Co has years of experience helping the businesses of Rancho Cucamonga manage their power usage and consumption. Our technicians are fully trained in the high standards set by the Occupational Safety and Health Administration (OSHA) and we can fix any corrections which may be necessary. Do you know if you’re getting the most bang for your buck when it comes to the electrical bill of your Rancho Cucamonga business? If you are unsure then it is time to contact Empire Electric Co and have us perform a power quality analysis and control to see that your business is using its electrical resources as efficiently as possible. You never know when a problem with your electrical systems will arise but when it does Empire Electric Co is here to make it right. We have a 24-hour emergency service to get you back on track. Your Rancho Cucamonga home runs on electricity but that doesn’t matter if the power can’t get to where it is supposed to go. Besides having your appliances and fixtures up and running it is equally important that they are efficient, so that you are not spending more money than you should, and that all the wiring is safe. Empire Electric Co provides a wide range of electrical services to make sure all the wiring and electrical works in your home are performing as they should. Replacing your home or business’ lighting fixtures with new, high quality, energy efficient models is a practical, cost-effective way to improve the look and feel of your Rancho Cucamonga home. At Empire Electric Co our team of fully licensed and insured in-house electricians are leading experts in a wide range of lighting fixture set-ups, and know how to balance form and function in a way that ensures you get lighting fixtures that are both more energy efficient, and better adapted to your precise needs and specifications. A ground fault circuit interrupter (GFCI) outlet is designed to automatically shut an electrical circuit off in the event that it detects that the current is flowing along an unintended path. This design is mainly intended to give protection from electric shock, but GFCI outlets can also protect you from fire. GFCI’s are required in unfinished basements, kitchens, garages, bathrooms, outdoors, or anywhere the outlet is near a sink. With Empire Electric Co, our team of electricians know how to install GFCI outlets correctly the first time, and test them to ensure that they give you full protection. Installing new outlets and switches in your Rancho Cucamonga home or business can be a complicated process, and problems may not be noticeable at first, but can cause you major inconveniences and even hazards down the road. Get your electrical switches and outlets working properly the first time with Empire Electric Co’s team of trustworthy, expert electricians. At Empire Electric Co we offer comprehensive electrical outlet and switch installation, replacement, and inspection services for your home. At Empire Electric Co our electricians have experience with a wide variety of ceiling fan & light types and styles, and can install a fixture that will give you the best balance between form and functionality. Our professional ceiling fan installations will also ensure that your Rancho Cucamonga ceiling fan runs in a way designed to optimize energy efficiency and give your room the best air circulation possible. When you need new circuits installed, trust your work only to experienced professionals. Professional installation of new circuits will ensure that they are fully code-compliant and that they are set up to optimize your electrical system’s overall performance. The electricians at Empire Electric Co can install circuits quickly and reliably, with a view towards maintaining the highest standards for safety and quality. If you have a breaker that keeps tripping, it is crucial to not ignore the problem. While a repeatedly tripping breaker might be caused by something as simple as a defective capacitor or a loose breaker, it can also indicate a far more serious problem such as a direct short. 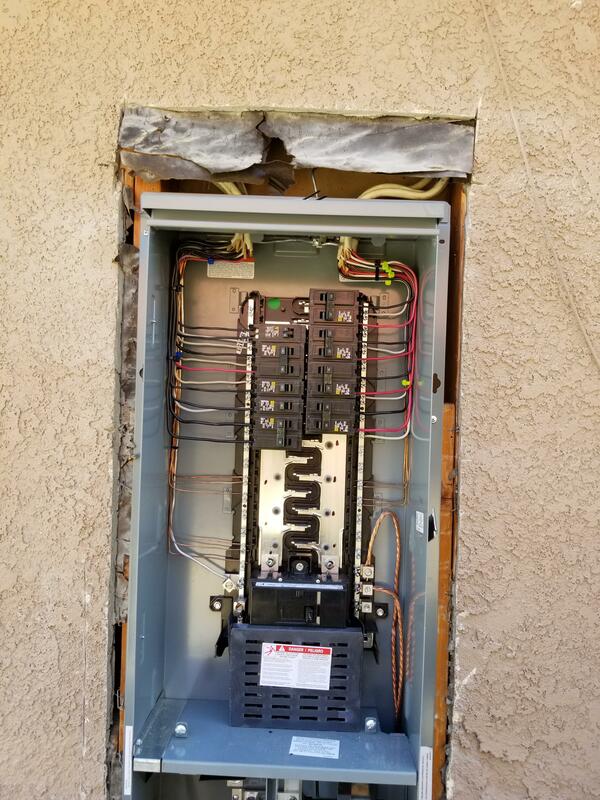 Don’t risk serious damage to you or your Rancho Cucamonga property; if you have a breaker that keeps tripping trust the electricians at Empire Electric Co to give you prompt, professional circuit breaker servicing that will make the safety of both you and your property our top priority. If your building’s electrical system has gone through modifications to accommodate increases in your patterns of consumption and your panel hasn’t been upgraded, then there is a good chance that your electrical system isn’t operating at its most efficient. What’s worse, a panel that hasn’t been upgraded to suit modifications in your electrical system can leave you and your property vulnerable to unexpected hazards such as fires. 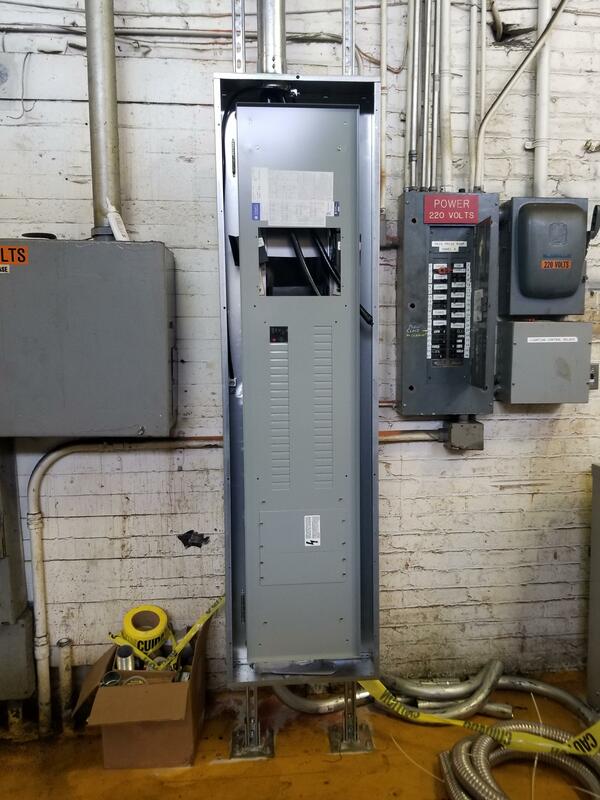 Fortunately, at Empire Electric Co our electricians have experience with electrical systems of all sizes and scales, and can safely and reliably upgrade your electrical panel to optimally suit your building’s electrical system. For residential or commercial electrical work, you’ll want to choose an electrical contractor with the experience to get the job done right. Here at Empire Electric Co, our goal is to provide only the best in remodeling electrical work in Rancho Cucamonga. Safety is our number one goal, and quality is our guarantee. For your important electrical jobs, you don’t want to go with just any contractor who promises the cheapest rate. We’re fully licensed and insured, with the experience you need but also the reasonable prices you want. Find out why local homeowners and businesses have trusted us for years as their first choice in remodeling electrical work. It’s crucial to get every detail right the first time with the installation of electrical equipment. At Empire Electric Co, our highly trained technicians have the expertise to ensure your electrical equipment is installed safely and properly, with every consideration to your home or business’s property and your own convenience. For remodeling electrical work in Rancho Cucamonga, we only install the latest, most durable equipment. Empire Electric Co has the experience needed to tackle every type of remodeling electrical work in Rancho Cucamonga, from small home upgrades to major business renovation. Trust in the electrical experts who put safety first. Give us a call today to set up your electrical remodeling consultation. When upgrading your home or business’s climate control system, it’s a good idea to get an inspection of your A/C & heating circuits. Circuit breakers wear out over time, and can cause a dangerous situation if they’re not replaced. This work should only be done by an experienced technician. At Empire Electric Co, we can ensure your Rancho Cucamonga breakers are up to date and safely installed. Don’t wait until your circuit goes bad and you’re stuck in a building that’s too hot or too cold. Renovations to older buildings almost always need an upgrade to existing electric systems. This is an undertaking that should only be done by a licensed professional. Outdated systems, breaker boxes, electrical panels, and wiring can cause fire or serious injuries when not correctly installed. Our experience with home and business remodeling electrical work in Rancho Cucamonga will ensure your building’s older system is upgraded with only the best electrical equipment, with safe, quality work to fit your home or business’s power needs. If you’re remodeling your home or business, contact Empire Electric Co today for your consultation on the best and safest electrical work in Rancho Cucamonga. If you need residential or commercial electrical repair in Rancho Cucamonga, you don’t need to look any further than Empire Electric Co. We’ve built a reputation with our loyal customers for quality electrical work, reasonable prices, and the utmost standards in safety practices. As licensed and insured electrical professionals, we strive for 100% customer satisfaction, with the safest and most updated technologies in the electrical industry. Our technicians are fully trained and knowledgeable, and take pride in their work as top electricians. Let us show you why you can count on Empire Electric Co for all of your home or business electrical repair jobs, large or small. Many do-it-yourselfers don’t realize how easy it is for electrical work to result in code violations. There are good reasons for today’s stringent code regulations: Poorly installed electrical systems can result in fires, injuries, and even death. There’s no way to safely cut corners with electrical work. All too often, a new Rancho Cucamonga homeowner or business owner will find out during an inspection that the previous owner’s electrical work resulted in dangerous code violations, which will need to be corrected. Any electrical work not done to code will result in insurance not covering damage related to electrical wiring and equipment. As you can see, hiring someone with experience in performing electrical repairs to proper code requirements is essential and can save you money and headache in the future. We can bring your Rancho Cucamonga electrical system back up to code, as well as properly install new work so it’s both legal and safe. For all your electrical repair work in Rancho Cucamonga, trust Empire Electric Co, the professionals who know the ins and outs of code regulations and safe electrical repairs. Give us a call today to set up your inspection. Baseboard heaters are an effective way to heat a room, but they tend to have some common issues, which can result in reduced heat, higher power bills, and even fire or electrical hazards. We have extensive experience in baseboard heating repair. Before you rip out your baseboard heaters in frustration, give us a call. We can take care of most maintenance or repair issues, and have your baseboard heaters working like new in no time. Also, an efficiently working baseboard heater will result in lower costs on your Rancho Cucamonga utility bills. For our commercial and residential customers who rely on generators for backup and occasional power, it’s important to have a contractor skilled in generator maintenance, repair and replacement. Our technicians at Empire Electric Co have the specialized knowledge to keep your generator properly maintained and repaired to last for years, or replaced with one that runs more efficiently and safely. If you have any questions about the maintenance and safe operation of your generator, give us a call. For your heating and power needs, call the electrical contractors that home and business owners have trusted for years for their electrical repair work in Rancho Cucamonga. At Empire Electric Co, we’ll be happy to answer your questions and to set up an inspection for any of your electrical needs. For the best in commercial and residential outdoor lighting installations, countless customers have trusted in Empire Electric Co for quality and reliability. Whether you’re looking to decorate a garden or augment your security, we have the expertise to install the right kind of lighting system to fit your needs. We supply lighting products from the best manufacturers in the residential and commercial lighting industry, for a wide variety of lighting systems ranging from attractive and inviting to practical and durable. As with all major electrical work, installing landscape & security lighting in Rancho Cucamonga should be done by a licensed professional. If not wired correctly, lighting systems have the potential to cause fire or injury. At Empire Electric Co, our technicians are fully trained in the proper installation of all lighting types, to ensure your home or business is well-lit, safe, and secure. We’re licensed and insured, and we guarantee our work. A nice garden, yard, or walkway can be made beautiful with the right kind of lighting. Lighting your landscape also brightens it up for safety and for nighttime socializing. Store-bought outdoor lighting products are often flimsy, and don’t have the upscale look of a professionally designed and installed landscape lighting system. We can improve your Rancho Cucamonga home’s value and appeal with high quality outdoor lighting that will transform your property from ordinary to gorgeous. For the highest quality landscape & security lighting in Rancho Cucamonga, trust the experts in electrical and lighting systems. Give Empire Electric Co a call today to set up your consultation to see what type of lighting is right for your home or business. Ceiling fans are attractive and add value to a home, as well as being practical. They’re also popular in many businesses today as a cost-effective way of keeping a large area cool, while adding charm and originality. Because installing a ceiling fan can be a tricky job, it’s recommended for qualified electricians to do the installing, to protect your property and its inhabitants from electrical shocks, fires, and injuries from improperly mounted fans falling to the ground. Many of our Rancho Cucamonga customers had thought they installed their ceiling fan correctly, only to find out later that it didn’t work at all. We encourage you to save yourself time, hassle, and risk, and give Empire Electric Co a call for your quick and affordable ceiling fan installation in Rancho Cucamonga. We have the reputation of being one of the area’s most trusted electrical contractors, with years of experience in safely installing residential and commercial electrical systems, lighting, and ceiling fans. For your protection, we’re fully licensed and insured. Ceiling fans instantly transform a room with a beautiful lighting fixture that circulates cool air in summer and pushes warm air down from the ceiling in winter. They not only add to a home’s value, but they save on utility bills year round. For the proper installation of your new ceiling fans, you can trust Empire Electric Co to do the job professionally and courteously. Businesses of all sizes can benefit from ceiling fans. They add a hip and stylish flair to a shop or salon, and industrial ceiling fans help to circulate the air in a large supermarket or warehouse. Ceiling fans of all types will help businesses save on their monthly utility bills. Because installing multiple fans can be difficult and time-consuming, we recommend you call us for your commercial ceiling fan installation in Rancho Cucamonga. If you’re looking to save on power bills, as well as add beauty and value to your home or business, give Empire Electric Co a call today to set up your consultation on ceiling fan installations. Our residential and commercial customers hire us to take care of their exterior lighting needs for a variety of reasons. Outside lighting is used for anything from convenience, to aesthetics, to security. Exterior lighting fixtures are readily available at home improvement stores, but these products are rarely made to last as long as professionally installed lighting. In order to minimize the risk of property damage and injury, it’s recommended that exterior lighting installation in Rancho Cucamonga is done only by qualified electricians who have a thorough knowledge of wiring and which fixtures will work best in their particular environment. Empire Electric Co is a fully qualified electrical contractor with years of experience in all fields of electrical work. We can help you decide on the best type of exterior lighting for your home or business, even combining features such as beauty with security, to add value as well as functionality for all your lighting needs. We’re licensed and insured to protect your investment, and we guarantee our work. Exterior lighting adds curb appeal and value to a home. Whether you’re interested in creating an inviting path to your front door, an artistic light display around your garden, or a motion-activated security lighting system to discourage intruders, we can help you with every stage of the installation. Our expertise will ensure that the custom lighting system for your Rancho Cucamonga home or business lasts for years to come. Commercial lighting needs are complex. At Empire Electric Co, we recommend you trust this job to us, to protect your business from wiring errors or other issues that can cause a safety or damage liability. Our technicians know the ideal places to install timed or motion-activated security lights on the outside of a commercial building. We also have experience with creating a beautiful, inviting custom look with exterior lighting to make your customers feel at home. Give Empire Electric Co a call today. We’ll be happy to set up a consultation to discuss your residential or commercial exterior lighting needs in Rancho Cucamonga. 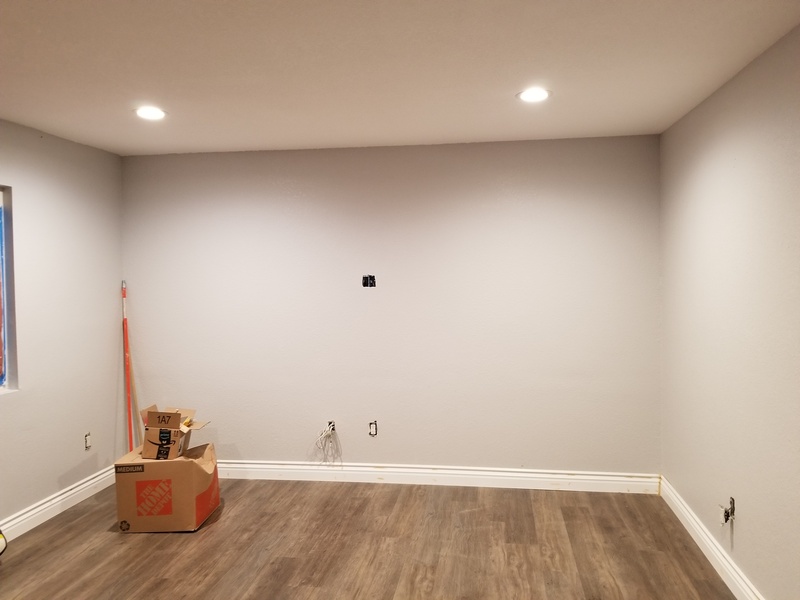 For residential or commercial building construction, you’ll need an experienced electrician who can handle your new electrical construction in Rancho Cucamonga safely and reliably. It’s crucial that new wiring and electrical equipment is installed properly the first time, so problems don’t develop along the road – such as the risk of malfunctions, fires, and injuries or even death from electric shock. Every region has strict building codes to adhere to regarding electrical work. Rancho Cucamonga buildings that are not up to code may not be covered by insurance in the event of property damage related to electrical problems. For this reason and many more, it’s important to only hire a fully licensed, insured electrical contractor with experience in new building construction. Empire Electric Co is known for some of the best electrical work in the area, with a reputation for impeccable new wiring and equipment installation, as well as maintenance and repairs. We have a full understanding of code regulations to protect your investment now and in the future. Our technicians are thoroughly trained in all areas of electrical construction, and they make safety and integrity their first priority with every job. We’re licensed and insured, and guarantee our work. We have extensive experience with commercial and residential lighting design and installation. We can ensure the light fixtures in your new Rancho Cucamonga building are installed properly and all the wiring is up to code. Find out why local residents and business owners trust us with their new electrical construction in Rancho Cucamonga. Give Empire Electric Co a call today and we’ll be happy to set up an appointment for your consultation on your new building’s lighting and camera systems. You could consider the lighting to be the finishing touch on any new construction job, or an older building might need a lighting upgrade. Whatever the reason, Empire Electric Co has the experience and qualifications needed to take care of your lighting installation in Rancho Cucamonga. We’re fully licensed, insured, and bonded, and our reputation for safety and excellent customer service sets us above the competition. As with any electrical job, it’s recommended that only an experienced electrical contractor install or repair wiring, circuits, and lighting. Improperly done electrical work can result in fires, property damage, and serious injury or death. Faulty wiring is one of the main causes for property fires. With that knowledge, would you trust your Rancho Cucamonga lighting installation to anyone without the experience? Whether you need a brand new lighting system for your new Rancho Cucamonga home or office, or your older lights and wiring need to be upgraded, Empire Electric Co can install the perfect lighting system for your needs, with the utmost safety standards in mind at an affordable cost. Give us a call today and find out why our loyal customers trust us for their lighting and electrical jobs. We’ll be happy to set up your appointment to discuss all your home or business needs for lighting installation in Rancho Cucamonga. Having a hot tub or spa is a luxury that more and more people are able to enjoy, with a variety of sizes and types of hot tubs at affordable prices. Of course, with the installation of a hot tub or spa, there’s a need for the electrical work to ensure a properly functioning system. But anytime you’re dealing with electricity and water, you’re facing a potentially dangerous system. The wiring needs to be meticulously installed and maintained to ensure the safety of everyone around, and to prevent damage to your Rancho Cucamonga property. That’s why it’s especially important to trust the work to an electrical professional with extensive experience with hot tub & spa electrical work in Rancho Cucamonga. At Empire Electric Co, we have a great reputation for the best and safest electrical installations and repairs, which includes hot tubs and spa systems. Don’t take unnecessary risks with your property and life. Leave the crucial electrical work to us, and you can start enjoying your hot tub or spa in no time. Many homes in the Rancho Cucamonga area feature a hot tub or spa for their residents’ and guests’ enjoyment. They’re fun and relaxing, and add value to your home. However, they also need specialized electrical work to run properly, as well as periodic checkups to make sure no wiring or functional problems have arisen. Empire Electric Co has experience with all types of home spas and hot tubs, and we’re licensed and insured to protect your investment and your family. Hot tubs and spas are a frequent luxury for many hotels, clubs, salons, and swimming pools. The high use of commercial hot tubs requires professional installation and repair of their electrical systems. It’s also crucial to schedule regular inspections and maintenance of hot tub & spa electrical systems in Rancho Cucamonga, to prevent customer injury, and to keep them open for everyone’s enjoyment. When it comes to your residential or commercial hot tub or spa system, you’ll want to trust the electrical contractors with experience and professionalism. Call Empire Electric Co today, and we’ll be happy to answer any questions you have about your home or business’s hot tubs and spas. Standby generators are a staple wherever there are critical systems that rely on a constant supply of electricity. Because people rely on an increasing variety of electric appliances today, standby generators are also becoming more popular with residences. These generators are an important power source in a temporary outage or emergency, and as such, regular maintenance is required. Breakdowns also happen, and that’s why it’s so important to have a trustworthy electrical contractor who can maintain, repair, and offer advice on the different types of standby generators in Rancho Cucamonga. 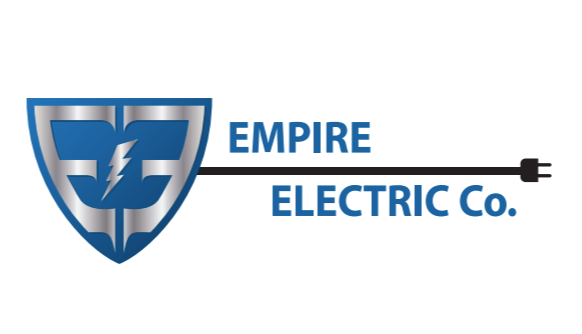 As a licensed and insured company with extensive experience in all electrical areas, Empire Electric Co is one of the region’s most reliable electrical contractors for electrical work and standby generators. Our knowledgeable technicians are skilled in the repair and maintenance of these versatile machines, as well as being able to set them up to the required systems and advise their owners on their operation and upkeep. Standby generators are meant to automatically kick in, providing the needed power to circuits when the main power source is down. After power is back up, the standby generator will shut down, ready for when it’s needed again. Commercial generators are vital to a number of safety systems, including medical and life support equipment, elevators, emergency lighting, and rescue services. In many cases, building codes require such generators. Because of their importance, it’s recommended for standby generators in Rancho Cucamonga to be maintained on a regular schedule, and repaired or replaced if necessary. Many Rancho Cucamonga homeowners use standby generators for backup power in the event of an outage. Although it’s unpleasant to be without heating or A/C, lights and electronics, and cold food, home backup generators are more than just a convenience. Some people at home rely on electrical power for important medical needs. For these reasons, it’s important to make sure you have an electrical contractor experienced in the use of residential generators. Empire Electric Co is there to provide residential and commercial customers with all the help they need with the installation, maintenance, and repair of standby generators. Give us a call today to learn more about this highly useful power source. Renewable energy is one of the biggest topics in society today. With gas and utility prices showing no sign of stabilizing it is important to start planning for your future. Empire Electric Co is here to help the commercial businesses of Rancho Cucamonga become more environmentally friendly while ensuring a less expensive energy bill. Our team of highly educated engineers, technicians and electricians have years of experience aiding the commercial businesses of Rancho Cucamonga gain a brighter future for themselves and their community. Empire Electric Co has a variety of options to get you the solar panel system you are looking for. Depending on the availability of space on your property we can install ground mounted or rooftop systems. Both ground mounted and rooftop solar panels have their own advantages. Empire Electric Co invites any of the interested commercial businesses of Rancho Cucamonga to give us a call or an email with any questions or concerns you may have. Don’t wait, start the process today to turn your Rancho Cucamonga property into a self sustaining money saver!